Congenitally missing teeth, or hypodontia is a condition whereby permanent teeth never form. This condition can occur with any of the 32 teeth. Congenitally missing teeth can also be genetically sensitive. This means that the trait can be passed down from one or the other parent. As modern man has evolved, the skull size has decreased. As the skull has decreased, the size of the jaw bone has also decreased but the size of our teeth have not. 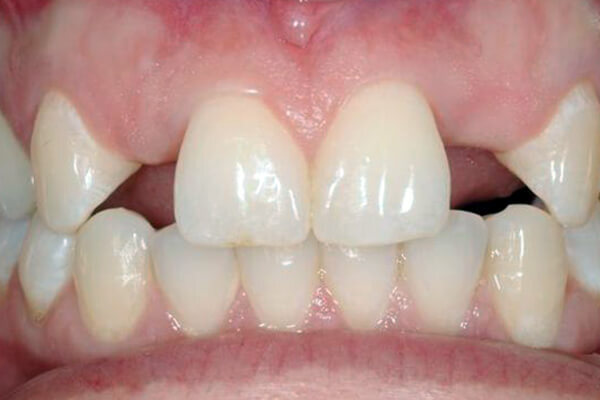 Every day, we see more and more patients with congenitally missing permanent teeth. It is common to be missing permanent lateral incisors or wisdom teeth, but any permanent tooth can also be missing. With today’s technology, dental implants are the state of the art, cutting edge treatment to replace congenitally missing teeth. It is important that if the primary (baby) tooth is present, it be left in place as long as possible before placing the implant. The presence of this tooth will prevent the bone from melting away, providing adequate support for the dental implant. If enough bone is not present, bone grafting can be accomplished to provide proper support for the missing tooth.